People think that great cars, even Hemi cars, can’t be found these days. They are certainly not as common as they were once, but Tim Wellborn showed that you can still located rare muscle even now with a great car that was not even known to the hobby prior to 2012. This car will be featured in Mopar Muscle and Musclecar Review magazines in 2013. The owner, Marcus Hanna of Grovebeck, Texas, had bought the car back in 1972, a real Hemi/four speed Road Runner complete with Dana Super Trak Pak, FJ5 Lime Light paint, and Air Grabber hood. He had done some drag racing with it, and had swapped the stick out for an automatic back in the day. 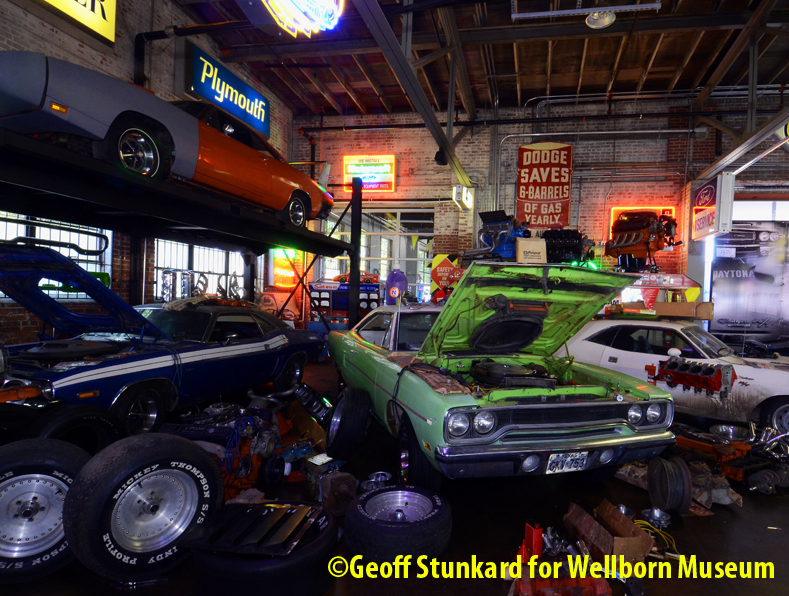 After it had accumulated just 31,000 miles, instead of selling the car when that passion faded, he parked it in a pole barn along with a stash of parts. He had gone on to become a judge in west Texas, and Tim was pretty excited to see this car in those surroundings. When the car was safely back in Alexander City, he and Philip Love, one of the coordinators of the day-to-day operations, decided they would use one corner of the museum to display the fresh find. The car originally purchased by Gordon Denzler has already been drawing attention and it was added to this display as well. This 1971 440-6 Challenger R/T with Shaker and long option sheet had been special ordered and purchased in Canada by Mr. Denzler in March 1971; it has a huge amount of paperwork with it (perhaps the most of any Mopar known to have been bought privately) as well as being one of the nicest ’71 R/Ts in unrestored existence. Tim had already planned to keep it that way. The Challenger R/T had been part of a larger purchase from the collection of John Hedges that had been made to supplement the museum several years ago, and had helped fill up the huge ‘dealership’ parts room that is part of the collection. As a result, around these two cars (and the Vanishing Point Challenger movie car on loan from Ted Stevens) are displayed a plethora of parts and pieces, some showing wear, some NOS, and even a few aftermarket items. Among them is aluminum 318 block that came from Herb McCandless.